The Italian adventure has come to an end for the Rea family. The final week of the trip was in Gorga about 60 kilometers southeast of Rome. One of the highlights was attending the large festival honoring the patron saint of Gorga, San Domenico, who lived during the 10th and 11th centuries. A large feast was eaten with family at 1:00a.m. after the festival! Chef’s maternal grandparents emigrated from Gorga in 1906 and he still has distant cousins living in Gorga. The Rea’s spent time with family and enjoyed the beauty of the area. In spite of all the great food some of the family did have to indulge in McDonald’s! (not Chef of course!) 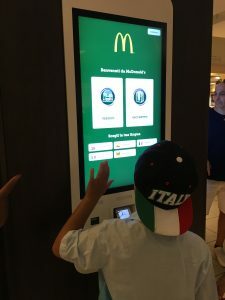 You will see from the picture that the Italian McDonald’s are automated and state-of-the-art! 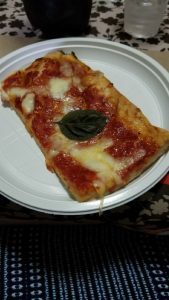 On their last night in Italy, the Rea’s reminisced about their favorite meal while on this extended trip. Each of them shared food experiences that were really memorable… the tiramisu and the wild boar at the Argitourismo, the rigatoni and pizza at Zia Rosa’s, cousin Maddalena’s pastries in Casarea, the fettuccine with truffles that Matteo’s grandfather gathered, (see prior blog posts) the prosciutto hanging in cousin Franco’s cellar, or Cousin Anna’s stuffed zucchini in Gorga… all reinforcing the fact that food brings people together. There’s practically no such thing as a “to go” cup in Italy and eating is almost always an event! The highlight of the trip was eating together, sharing family history, and creating memories. 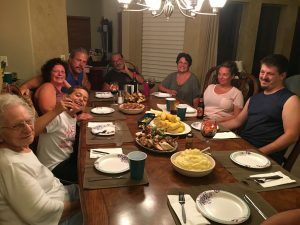 And finally when they returned home, they had a big “homecoming” meal with Chef’s mom and relatives who had been staying with her while Chef and family were away, again reinforcing the love and joy of family. . . . .particularly gathered around the dining table! The children will have great stories to share with friends for years to come and of course chef returns to work inspired by generations of family who have a love of food and serving others! Casarea, Italy has been a highlight of the Italian adventure thus far. 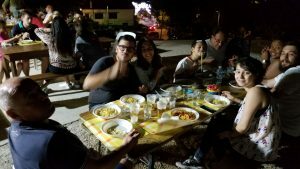 The Rea’s had a wonderful time last weekend in Casarea, a neighborhood of Casalnuovo di Napoli about 20 minutes east of Naples and in the shadow of Mount Vesuvias. Casarea is the birthplace of Chef’s paternal grandfather. It was in 1906 that his grandparents, Salvatore and Nancy (de Falco) Rea, immigrated to the US. They settled in Mount Kisco, New York and had seven children. Chef has many first cousins in New York, but all other relatives are still in Casarea which derived its name from his ancestors. 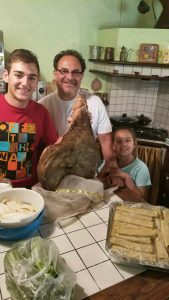 While true for most Italian families, in Casarea it is abundantly clear that cooking with fresh ingredients and love of family is in Chef’s genes! He has so been enjoying meeting family and learning about their business ventures, predominantly in the food industry. Antonio Rea (yes, many relatives with that name!) who is a nephew of Chef’s grandfather, was a produce purveyor. His daughter, Felicia, still works a patch of land in the communal gardens. 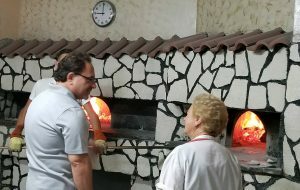 In addition, Chef and family have also met a cousin (another Antonio Rea), who operates the family pizzeria, Pizzeria da Rosa. Antonio’s sister, Maria Maddelena manages Magda Cakes, a fabulous cake and pastry shop. Can you imagine keeping all the Anthony’s, Antonio’s and Tony’s straight on this trip? 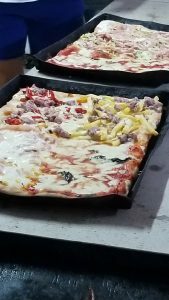 In the photo gallery below you will see Chef with his cousin at Pizzeria da Rosa, images of the fantastic pizza at Pizzeria da Rosa, and Maria Maddelena serving a pastry from Magda Cakes. 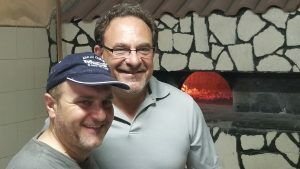 For information on Pizzeria da Rosa please visit www.facebook.com/pizzeriadarosa. The family has been in Rome and enjoying another week of Italian adventures before heading home. Stay tuned for updates and follow on Facebook! 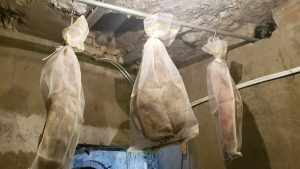 As the Italian adventure continues, Chef Tony and family are staying at an agriturismo, Il Selvatico, in Poggi del Sasso, a hilltop town near Grosetto in the Maremma region of Tuscany. The owner of Il Selvatico, Guilin, restored and expanded his grandfather’s original farmhouse by himself over a 6-7 year period. It’s quite extensive and includes a vineyard, olive farm, garden and more. Guilin and his mother are hosts, caretakers, hunters, farmers, and chefs. The agriturismo is half-board with breakfast & dinner included with everything coming from the land. 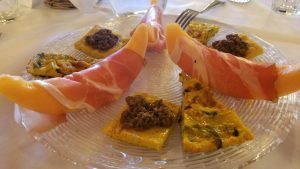 The Rea’s first meal was antipasto with polenta & ragu (From a mix of meats including fallow deer) bruschetta with portabellos, housemade pasta, wild boar, tiramisu, espresso & grappa. Yesterday they visited a sheep farm and enjoyed an assortment of cheeses. The owner of Il Selvatico, Guilin, restored and expanded his grandfather’s original farmhouse by himself over a 6-7 year period. It’s quite extensive and includes a vineyard, olive farm, garden and more. Guilin and his mother are hosts, caretakers, hunters, farmers, and chefs. The agriturismo is half-board with breakfast & dinner included with everything coming from the land. 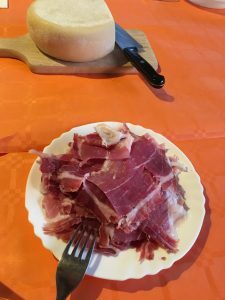 The Rea’s first meal was antipasto with polenta & ragu (From a mix of meats including fallow deer) bruschetta with portabellos, housemade pasta, wild boar, tiramisu, espresso & grappa. Yesterday they visited a sheep farm and enjoyed an assortment of cheeses. 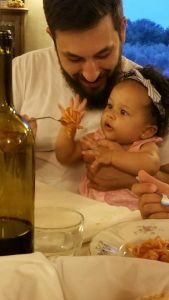 Six month old Harper enjoying pasta with her father! Chef and family are also enjoying wines that are becoming quite well known from this southern region of Tuscany, Montecucco. The wines in Montecucco are primarily made from the sangiovese grape as in many other Tuscan regions. Brunello di Montalcino, Vino Nobile di Montepulciano and Chianti Classico are all made from the Sangiovese grape and yet they are all unique. Sangiovese is an impressionable grape variety that easily takes on characters from the specific soil or terroir so although most of the wines from Tuscany have this grape as a base there is a never ending flow of different styles, flavours and aromas. Sangiovese is one of Italy’s most widely grown grapes but it is in Tuscany that it is most prominent. The conditions are right to make really excellent wines unlike any others in the country of Italy. In Montecucco you can still find excellent wines at a very reasonable prices but as the wines from the region become better known, no doubt prices will increase. Chef Tony and his family are about to embark on an Italian adventure of pasta, pizza, and family! The adventure begins after completing two catering events today. We’re not sure when he had time to pack! Chef Tony, Susan, and their young children, Nicolas (Nicky) and Lilianna (Lily); adult son, Anthony, fiancé’ Alisha, and their 9 month old daughter, Harper, (Chef’s granddaughter) depart for Italy tomorrow. The last family trip to Italy was in 2011 to visit Chef Rea’s mother’s ancestral home. This is a long anticipated family trip to visit relatives in the Rea ancestral town of Casalnuovo di Napoli (Village of Casarea). 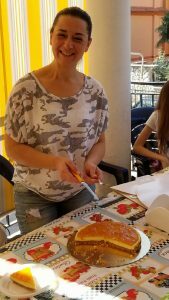 They are looking forward to meeting and spending time with distant cousins, exploring the area, eating fresh pasta and seafood, and enjoying pizza at Pizzeria di Rosa, a pizzeria owned by Chef’s cousin. 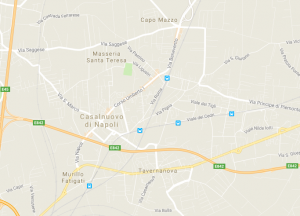 Casalnuovo di Napoli is a municipality in the Metropolitan City of Naples in the Italian region Campania, located about 13 kilometres northeast of Naples with a population of about 50,700. The municipality of Casalnuovo di Napoli contains the frazioni Casarea, Tavernanova, and Licignano. Experience the Rea’s vacation with us as we will keep you updated with posts along the way. We wish Chef Tony and his family a safe and fun-filled much deserved vacation. It has been a very busy year and we hope they can relax, enjoy time with family, and indulge in wonderful Italian cuisine and wine. We’re looking forward to new ideas for pasta recipes. 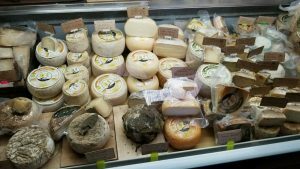 In the meantime, our kitchen will, of course, be rolling out our delicious fresh pasta available at the Uptown Farmers’ Market every Saturday and available by special order by calling us at 602 485-9924. Special orders can be picked up at Uptown Market or at our kitchen at 1825 West Crest Lane. 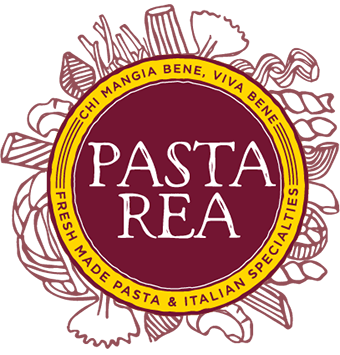 We can live vicariously by eating Chef Rea’s pasta here locally!